This is an about page index featuring a photos of founder and creative director Emma McNamara and a biography of the studio. "The best interiors are the ones that make you feel at ease in the world, that tell your story, that are timeless." Sunday Folk Textiles is an Australian textile studio that makes painterly cushions designed for laid back living. 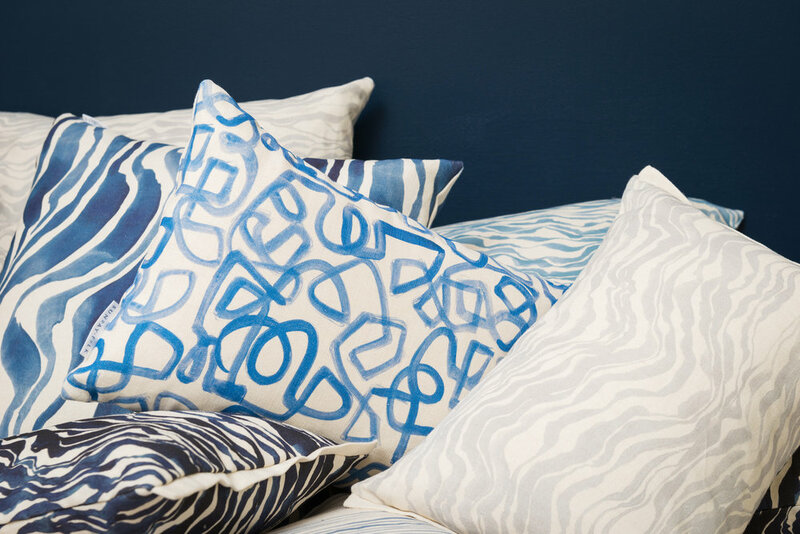 After years spent in Interior Design and Decorating, working on projects as diverse as five-star resorts and bungalow homes, designer and artist Emma McNamara has created a collection of luxury cushions designed to bring that "Easy Like Sunday Morning" feeling to your home. Inspired by the nuances of the Australian coastline, the textiles capture moments in time- the beauty of walking slowly along a sandy beach and noticing the light dance on the waves, watching the tide roll in over creased rock faces, of living at a deliberate pace. "I wanted to create cushions that get better with time, have a weighty handle to them, that are made from the natural world with all it's character, knobbly bits and beauty." The collections are printed in Australia on a linen/cotton base cloth that is woven in England. Printed on natural fibres, the textile has it's own character which enhances the artwork and lends itself to the relaxed look of the cushions. Specifically designed to be a timeless addition to your home, the designs are able to be mixed as a complete collection or to complement your existing surroundings. "There is such beauty in the details, the small things, the warbly lines, the streaky paintings, the imperfect smudges"
All the designs have been created by Emma in her Northern Beaches studio, starting as drawings, and are painted in unique colours mixed by hand. All Sunday Folk Textiles's cushions are made here in Sydney by a workroom that operates under the strict guidelines of The Ethical Fashion Production Council of Australia. Easy like Sunday morning, lazy beach strolls watching the sun dance over the water, the tide pool waders and wanderers, drawn in by the details, the lines, the colours // Coffee sipped over the paper with the warm sun on your back, sleep-ins on crispy linen sheets// Salty mornings spent floating in the ocean pool, looking at the sky. Afternoons spent mucking about in boats, wind in your hair, a glass in your hand // Whiling away the hours, strolling under dappled shadows of greenery above // The contentment of beauty, simplicity and days soaking in the sunlight.